Our InstantKB 2018 update is packed with new features and improvements. In this article we'll detail all the new features and highlight the significant improvements. As always should you have any questions regarding our InstantKB 2018 update please don't hesitate to contact us. To help you easily deliver beautiful consistent support articles InstantKB 2018 now features support for Markdown and introduces a new visual Markdown editor. Markdown is a lightweight markup language which will allow you to easily create semantically correct, well formed HTML for your support content without having to know HTML or worry about the underlying HTML you produce. The new Markdown editor is completely optional and you can of course continue to use the regular HTML editor already offered by InstantKB. 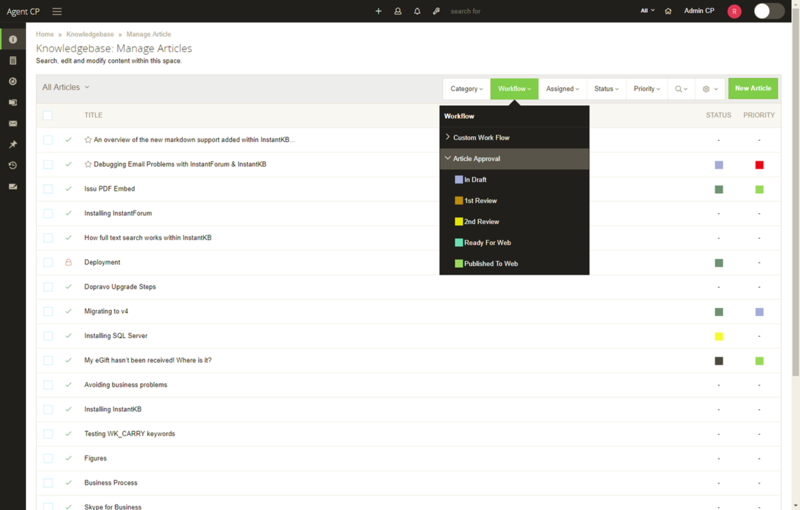 We've made it super easy to migrate existing HTML based articles to Markdown. You can now work on both the HTML and Markdown version an article at the same time and choose at anytime which version of the article you would like to serve to end users. InstantKB 2018 introduces a new feature we are calling "Field Logic". Field Logic allows you to now create completely dynamic forms within InstantKB that will respond in real-time to user supplied input or user events. Field logic can be applied to any built-in or custom field and can be used when working with support articles or support tickets. So how does field logic work? When editing any form within InstantKB you can now hover over a field to reveal a "Field Logic" button. Clicking this button will open the new Field Logic dialog. From here you can add client side events to the field (focus, blur, change, keypress etc). Each event you add supports multiple conditions and multiple actions. The conditions control if the actions will execute when the event occurs. For example you may wish to show or hide additional fields to users based on specific selections within the form. The InstantKB forms designer has also been completely redesigned to fully support a new drag & drop interface. This makes it even easier to customize your InstantKB forms or add new custom fields into your forms. You can of course also drag existing fields to rearrange he fields within the form. We've also added a new "Preview" mode when editing forms and the ability to now embed InstantKB forms into your own web site.The new "Preview" mode allows you to preview your form and test any field logic you may have defined on the fields within the form. The preview option can be found when editing any form within InstantKB 2018. To embed an InstantKB form into your own web site or web application you'll need to visit the Admin CP > Spaces area and edit any existing "Ticket" based space. When editing ticket spaces you'll see a new Embed button alongside the chosen form for the space. Clicking the embed button provides the HTML nesscarry to embed the form for this space into your own web site. 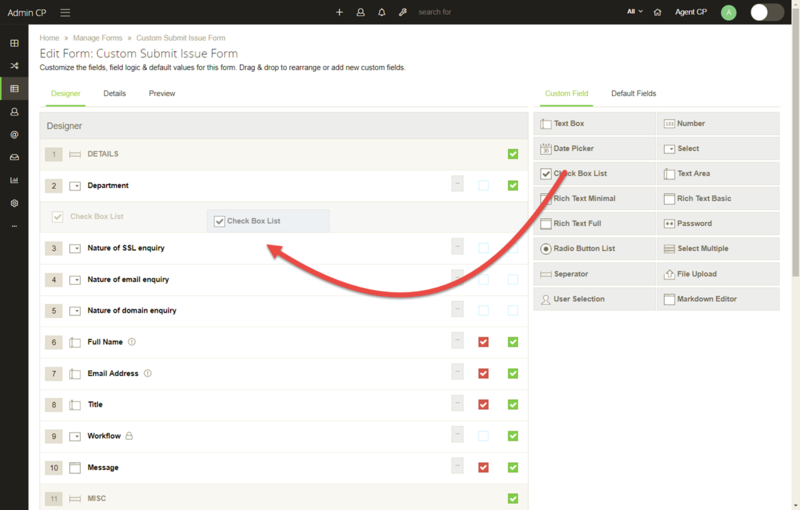 If you embed a form and the form is not public users will be prompted to login before they can see the form. We've introduced a new global find and replace feature available via the InstantKB administrator & agent control panels. This allows you to now easily globally replace any strings within any support article or support ticket. TThis can be especially helpful if you wish to globally replace a old product or feature name within your support content. 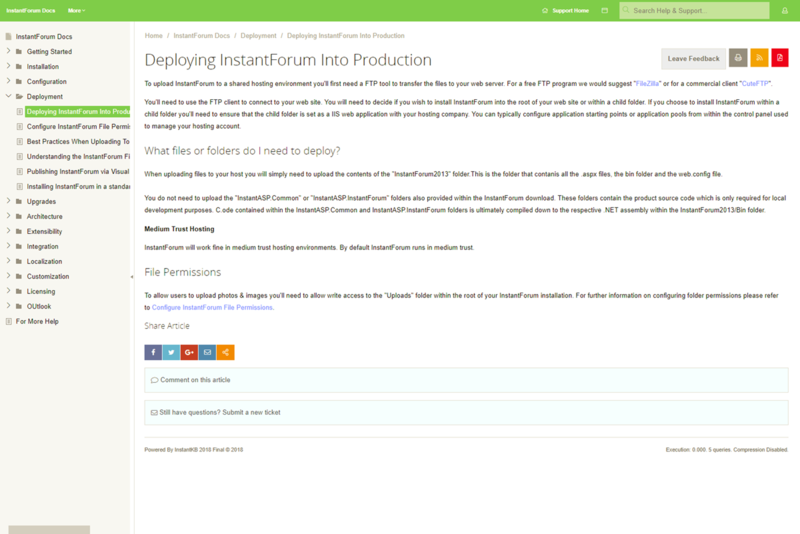 With InstantKB 2018 you can now invite other users to participate within any shared support ticket. You can also now relate multiple contacts to private support tickets. If a ticket is shared with a registered user within InstantKB the ticket will be visible to the user via the My Tickets area and the user will be able to view all replies and post a new replies within the support ticket. Every aspect of the InstantKB 2018 user interface has been updated to now utilize our own Ignition UI framework first introduced with InstantForum 2017. We've revamped the search and filter user interface when managing support articles and support tickets via the agent control panel. The goal here was to make it even easier for agents to search and find relevant content. You can now quickly filter by category / label, work flow, priority, status, & assignee. For further control you can also expand the search options to search by keyword, date range, related contacts & several other search parameters. 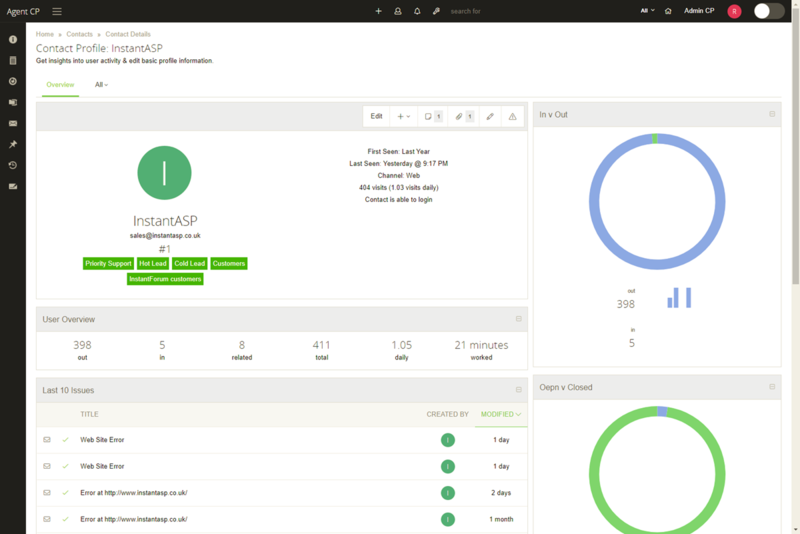 We've introduced a new dark mode for both the administrator & agent control panels. You can easily toggle between the light or dark mode via the switch within the top right of both the administrator & agent control panels. 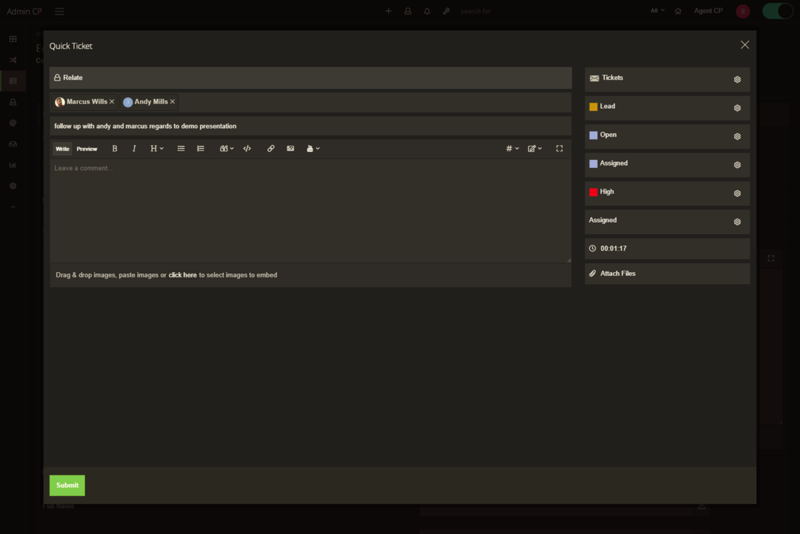 If you spend lots of time working within the InstantKB agent control panel (creating content or responding to support tickets) you 'll hopefully find this new dark theme a little easier on the eyes. 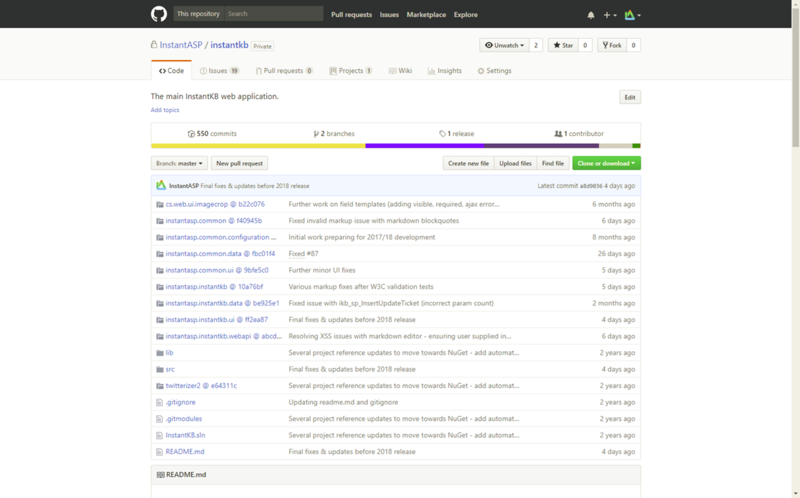 We've separated the existing documentation view into it's own unique support space. Previously the documentation view was an option within "Knowledgebase" tabs. 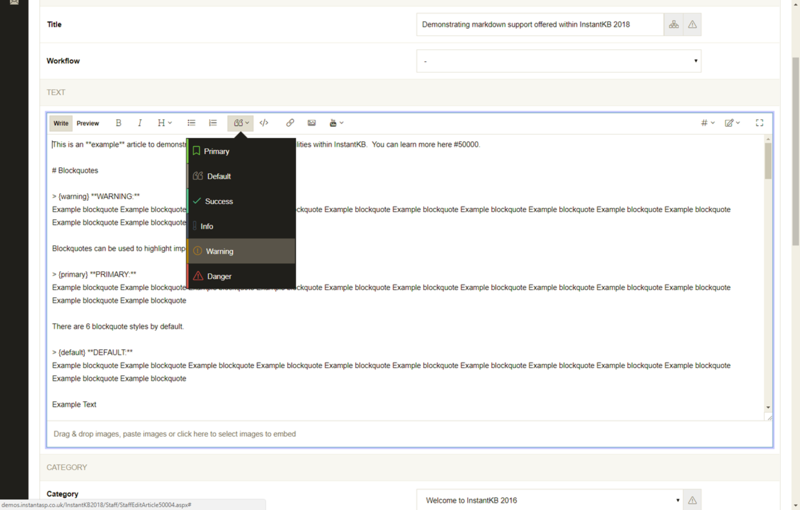 Separating documentation into it's own unique support space make creating new documentation spaces super easy and now allows documentation spaces to have a tailored default form. 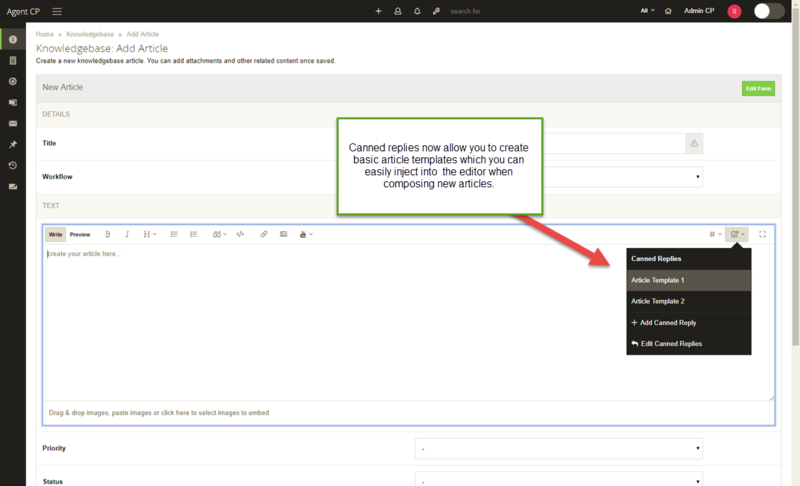 In addition we've streamlined the experience when editing content via the agent control panel with documentation spaces. For end users we've also improved the documentation view allowing users to now share or comment on documentation similar to regular knowledgebase articles. With the introduction of Markdown support you can now also of course add your own custom Markdown fields into any form within InstantKB. We've also added a new user suggest custom field. The user suggest field looks like a regular text box however it will search and present a list of contacts as you type. You can select one or multiple contacts to associate with the custom field. 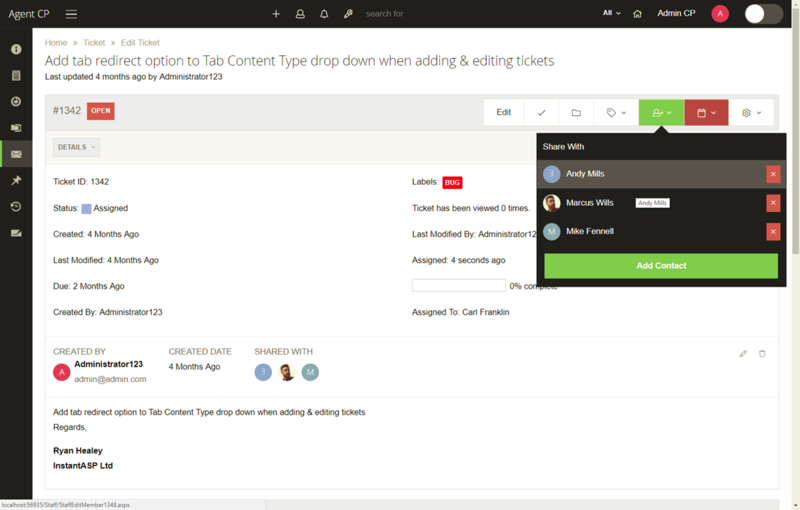 We've made it even easier for support agents to quickly create new private or shared support tickets. 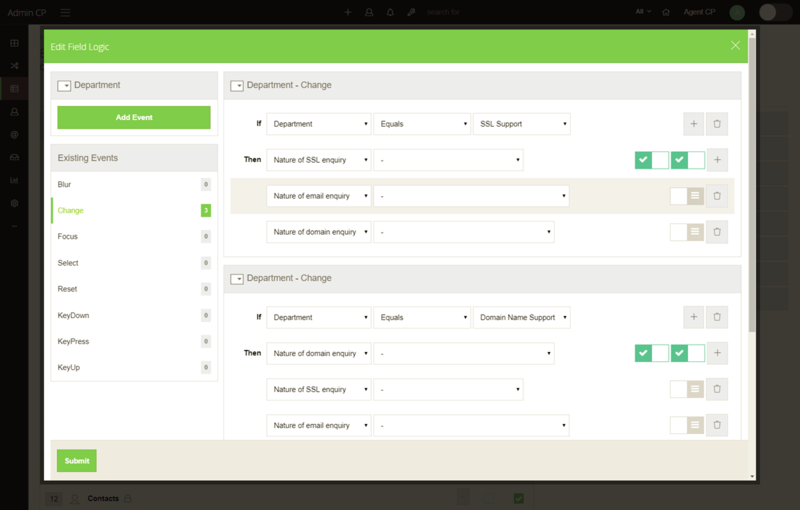 The new quick ticket UI is available from every page within the InstantKb administrator and agent control panels. Contacts are automatically created within InstantKB whenever a new support issue arrives via any of the supported inbound channels (emails, social, web, chat, phone). 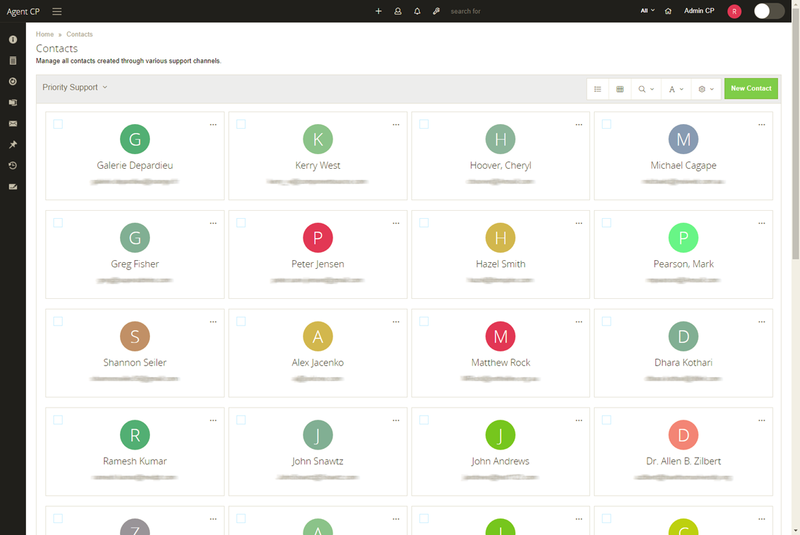 To help you manage these contacts we've visually redesigned the Manage Contacts area and introduced a number of new search options. 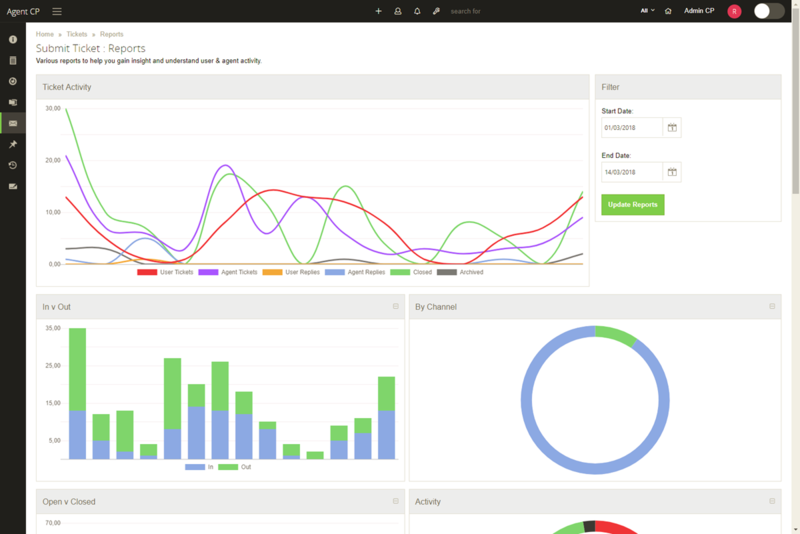 We've also redesigned the profile page and introduced a number of new reports for contacts to offer better insight into recent user activity. 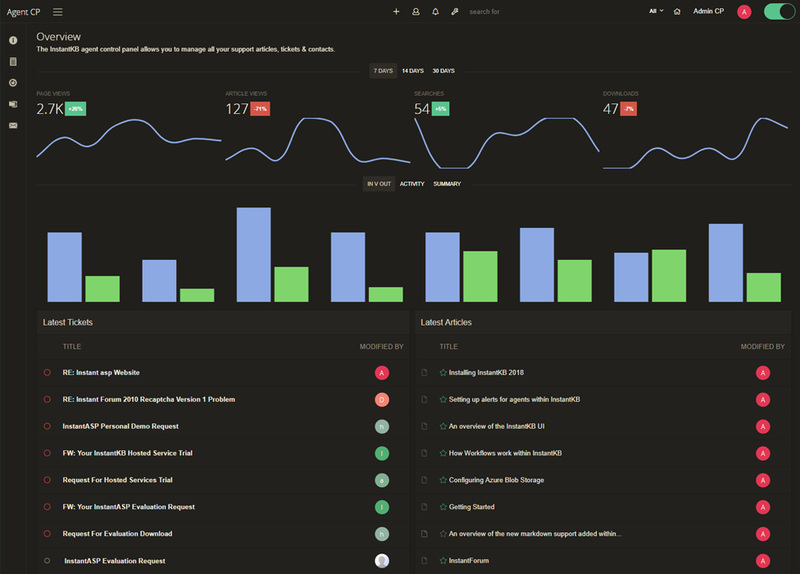 We've revamped every single report within InstantKB and introduced a number of new reports and visualizations. We've made key reports such as the space activity report and the search reports more granular now showing separate user & agent activity. We've also added a number of new performance indicators to contact profile pages to help support agents identify if a particular contact is receiving a satisfactory level of support. We've improved our responsive design with InstantKB 2018 to ensure both the administrator & agent dashboards work effectively on smaller screen sizes. We've also made several improvements to the responsive design presented to regular end users when consuming support content or submitting support tickets. We've improved our existing canned replies feature to now also support the new Markdown editor. You can now create canned replies in both regular HTML and Markdown. The appropriate canned reply will be used depending on the type of editor (HTML or Markdown) being used. We've also added canned replies to regular contact spaces (not just ticketing spaces), this allow you now to use canned replies as a template for creating new content within the Markdown editor. With InstantKB 2018 we’ve moved all our source code over to GitHub. For our customers, this means InstantKB 2018 will now play nicely within your own Git based environments. To achieve this transition, we’ve also removed all physical DLL dependencies within InstantKB and moved 100% to NuGet packages. This ensures binaries are not uploaded to your source control repositories. In addition ".gitignore" files are now provided within the InstantKB 2018 download to ensure only the necessary files are pushed into your source control repositories. With InstantKB 2018 our installation script has been updated to now create all the initial data you'll need to quickly learn & get started with InstantKB. This includes default SLAs, views, types & colour coded work flow steps, statuses & priorities. Various improvements to phone suppor now utilizing the latest twilio.com API. We sincerely hope you enjoy the updates in this release. If you'd like to upgrade to take advantage of the new features detailed here but have concerns of course please don't hesitate to please don't hesitate to open a new support ticket or contact us. We are here to help and will happily assist with your upgrade.